There's only one thing you love, Danny: that's danger. Let us not forget that Soderbergh's Ocean's Eleven is a remake of Lewis Milestone's 1960 original, and let us also not forget that the original had a very different tone. While they do share similar story arcs, the original was a much less serious affair – essentially, it followed the Rat Pack doing their thing in Vegas, with a little plot thrown in for extra credit. As such, Saul Bass' sequence – while seemingly over-playful when dismembered from the film, and more so against Nelson Riddle's goofy big-band score – is an appropriate introduction to this Rat Pack caper: loud, jaunty, and, of course, classic Vegas. Bass was inspired by the electricity of Sin City itself, employing a simple dot motif for the type and border elements, evoking the colorful chasing-lights and other signage found on the Strip. The title sequence is split into two distinct sections, with the first showcasing the names of the eleven key players, set against scoreboard-style numerals blended into one another through accumulative animation. The second half is more freestyle, with animated dots forming graphics and the remaining credits. 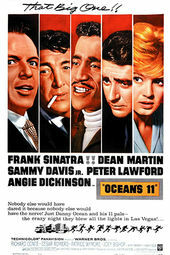 As a film, Ocean's Eleven was a modest blockbuster, fetching $5.5 million at the box office, inching it into 1960’s top studio releases. And while Bass' titles weren't his most memorable in the public eye (and no doubt overshadowed by his work on Psycho, which was released that same year), they do remain a favorite amongst designers and motion graphic artists for their modernist sensibilities, attention to typography, and technical execution.